MBDC is proud to support C&A in becoming the world’s first retailer to offer Cradle to Cradle Certified™ GOLD denim jean garments. Over the past year, we worked closely with C&A, their supply chain, Fashion for Good and other assessors to address challenges in designing such a complex product. The process included evaluating and optimizing the garment for human and environmental health, recyclability and biodegradability, renewable energy use and carbon management, water stewardship and social fairness. 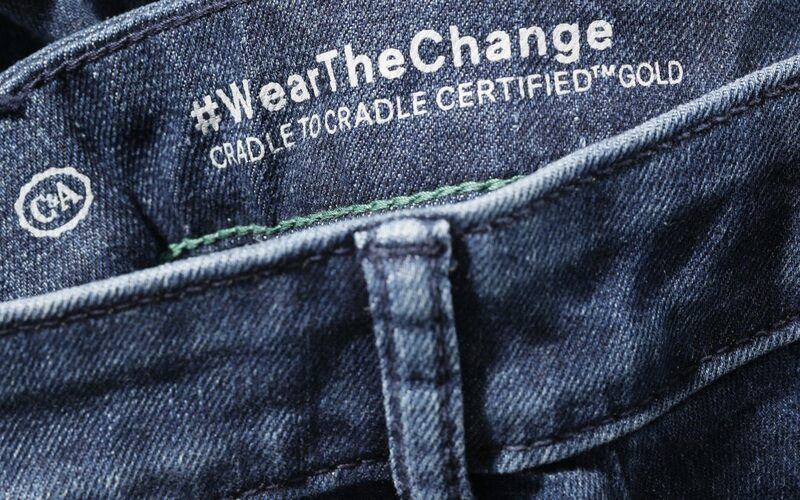 Designed in partnership with Fashion for Good, an open-source initiative that supports the transformation of apparel culture toward a circular economy, C&A’s new Cradle to Cradle Certified™ denim garment release is accompanied by the toolkit Developing Cradle to Cradle Certified™ Jeans. This toolkit includes concrete solutions on how to approach complex products and projects, such as jeans, which contain multiple technical and biological nutrient components (from thread to zipper) to reach product certification at the GOLD level. Efforts behind both Fashion for Good and C&A’s Cradle to Cradle Certified™ GOLD denim jeans exemplify William McDonough’s Five Goods: good materials, good economy, good energy, good water and good lives. McDonough is co-founder of MBDC and Fashion for Good. Assessment for such a complex product requires time, determination, openness and trust, and is most successful through deep collaboration. Key challenges in creating C&A’s Cradle to Cradle Certified™ denim jeans included the amount of materials from both the biological and technical cycles that came together to form the final product, and the levels of supply chain partners providing all the necessary materials. Mixing materials from the two cycles can reduce the material reutilization potential if they cannot be separated at end of use, and multiple tiers of suppliers can complicate assessment at the factory process level. As a result, C&A created a network of collaborators that included MBDC and partners Eco Intelligent Growth (EIG) that together planned the dynamic assessment and created innovative solutions that have a positive impact during manufacturing, use phase and end of use and next use planning for the product. Another challenge faced was the physical flexibility of the garment. Advances in elastane chemistry by Asahi Kasei allowed for comfort and stretchability while also maintaining the biocompatibility of traditional denim fabric that is a key assessment criteria for the Cradle to Cradle Certified™ Product Standard. In 2017, MBDC also played an integral role in optimizing C&A’s Cradle to Cradle Certified GOLD T-shirts, a compostable garment illustrating the possibility of sustainable fashion for the mass market. In addition to C&A’s T-shirts and jeans material health assessments, MBDC evaluated processes at Cotton Blossom and Pratibha Syntex, the two India-based manufacturers who helped C&A develop and produce the certified products, and were happy to find both manufacturers already operating best-practice programmes for water treatment, social fairness, energy efficiency and renewable energy. Along with offering the Developing Cradle to Cradle Certified Jeans guide, the collaborators have released an Assessed Materials Almanac, which showcases materials and ingredients currently assessed for C2C Material Health available for use in the fashion industry. This is the first time such an in-depth overview is publicly available to enable brands, retailers and manufacturers to get started on their Cradle to Cradle Certified journey. Both the Almanac and Developing Cradle to Cradle Certified Jeans guide are available at Fashion for Good. Already done with your pair of denim jeans? Become part of C&A’s ‘we take it back’ recycling program, and for one bag of your unwanted clothes and shoes, they’ll give you a 15% voucher in return. See what else C&A has planned on its sustainability movement at #WearTheChange.